America’s PowerBall is responsible for creating more record high payouts than any other lottery in the world with several exceeding half a billion dollars. The draw takes place at approximately 04:00am Irish time every Thursday and Sunday and you can play and win all the same prizes at Lottoland. How doesplaying the PowerBall at Lottoland work? Instead of entering the PowerBall draw you are placing a bet on the outcome. You pick your numbers in the same way and you can win all the same main game prizes, including the jackpot, as you could had you entered the official draw. How do I choose a line and play? Choose 5 numbers from the main pool of 1–69 and 1 further number, known as the PowerBall, from a pool of 1–26. You can also select the QuickPick option (Quick+1) and this will choose a line for you. Once you have chosen your numbers, select which draw you want to bet on, either Thursday or Sunday, and press Submit. This will take you through to a checkout – at this stage just click Confirm and proceed to place your bet. You will win our jackpot if your 5 main numbers and 1 PowerBall is the same as those in the official PowerBall draw. Can I will all the same prizes playing with Lottoland? The PowerBall jackpot starts at $40m (€31m) and is uncapped, creating the potential for huge payouts. You can also bet for twice the PowerBall jackpot by selecting the DoubleJackpot option. See below for information on how this feature works. The PowerBall draw takes place every Wednesday and Saturday night in Florida, USA, at approximately 11pm, which equates to 4am on Thursday and Sunday in Ireland. The odds of winning the jackpot are 1 in 292,201,338. A breakdown of all the odds for each prize tier, together with estimated returns is included below answer #10. What is the PowerPlay option? The PowerPlay feature allows you to boost the potential winnings on all non-jackpot prize tiers by either x2/x3/x4/x5 or x10. The MegaPlier number is drawn by a random number generator. Let’s say you win the second prize tier having selected the PowerPlay feature. If the normal payout is €658k you will win either x2, x3, x4 , x5 or x10 that amount depending on the number drawn out. It costs €1 to activate the PowerPlay feature. When you bet on the outcome of the PowerBall you will be treated as though you entered the official draw and will receive the same main game prizes should you win. The table below explains the different prize tiers, odds of winning each prize tier and the estimated individual returns for each prize tier. The information below is provided as a guide only. Should you win you will be paid out in euros, so the prizes are provided in euros. Please bear in mind that the values shown are dependent on the dollar to euro to exchange rate. PowerPlay option – Should you select the PowerPlay option and match 5 numbers you will win approx. €1.75 million. For all other non-jackpot tiers your prize will be multiplied by 2, 3, 4, 5 or 10x. Subscriptions remove the hassle of buying repeat lines and the fear of missing out on that big jackpot win. Our Subscription feature allows you to set up a running bet or bets on a given lottery draw. The subscription is open ended and will run for as long as you want it too. You can opt out at any time. What is the JackpotHunt feature? Our JackpotHunt feature allows you to decide how big a jackpot you want to go for. So, for instance, if you only want to go for a jackpot when it is over €50 million, simply set your participation level to €50 million and when the jackpot reaches that figure you will start participating. 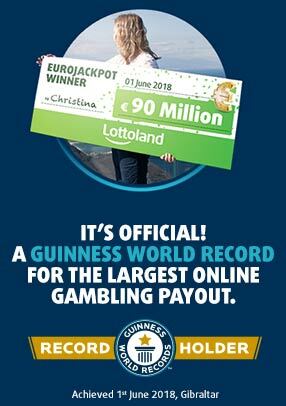 You will continue to participate until the jackpot drops below the €50 million figure. The JackpotHunt feature is open ended and will run for as long as you want it too. You can opt out at any time. Why should I play PowerBall at Lottoland? This incredible draw grows without any limit and has created several of the biggest jackpots of all time. In fact, PowerBall is responsible for seven out the top ten biggest jackpots in history. You can also boost your potential winnings by selecting the attractive PowerPlay option. In addition to this a single line costs from just €3.50.